Bolton was asked during a briefing for reporters if he would acknowledge Iran is complying with Joint Comprehensive Plan of Action (JCPOA), as the deal is called, and told reporters, "I don't, no." "I think there are plenty of cases where we're simply incapable of saying whether they're in compliance or not," Bolton said. "There are others where I think they've clearly been in violation." Bolton said one example was Iran's production of heavy water that repeatedly exceeded the limits of permitted under the 2015 agreement. Heavy water, or deuterium oxide, is a form of water used in nuclear reactors. It can be used to produce plutonium, a key fuel for nuclear weapons. "They're almost in the heavy water production business," Bolton said. "They sell excess to Oman. They've sold it to European countries. It's a way of keeping the heavy water production facilities alive." "They're warm, and that's part of the danger and they have exceeded the limits," he added. Bolton said there were other Iranian violations that he could discuss but did not do so during the briefing on President Trump's decision to pull out of the international agreement. The president had until May 12 to decide whether to renew a waiver of financial sanctions on Iran required under 2012 legislation. In January, Trump announced he would not renew the waiver unless shortcomings in the JCPOA were fixed. NSC spokesman Robert Palladino said the most notable Iranian violations of the JCPO involved exceeding limits on heavy water stockpiles in 2016. "Iran has also regularly pushed the boundaries of the deal, for example failing to meet expectations on its operation of advanced centrifuges, as the president highlighted in his speech on October 13, 2017," he said. "Iran's leaders also stated that they would not allow inspections of military facilities, a position that is clearly inconsistent with Iran's JCPOA obligation to implement the Additional Protocol," Palladino added. The JCPOA limits Iran's stockpiles of heavy water to 130 tons and Iran exceeded that limit at least twice since 2016. Under the terms of the JCPOA, Iran is allowed to sell heavy water produced to prevent exceeding the 130-ton limit. In June, Tehran announced it was shipping 20 tons of heavy water to avoid breaching the accord. Sen. Tom Cotton (R., Ark.) disclosed a number of Iranian violations of the nuclear deal in July when the State Department was considering certifying Iran in compliance with the accord. On heavy water production, Iran repeatedly exceeded limits allowed under the JCPOA for heavy water stockpiles and the material is "key to Iran's plutonium pathway to nuclear weapons," Cotton stated in a letter to the State Department signed by three other senators. Under a loophole in the nuclear deal, the Iranians have claimed a right to produce unlimited amounts of heavy water and to retain ownership of the stockpiles as long as Tehran claims to be seeking foreign buyers for the heavy water, the senators stated. "In doing so, Iran has effectively read the heavy-water limitation out of the JCPOA," the letter states. Operating more advanced nuclear centrifuges than are permitted by the agreement and maintaining more advanced centrifuges than required for its permitted nuclear enrichment activities. German intelligence agencies reported in 2015 and 2016 that despite the JCPOA prohibitions, Iran has continued illicit attempts to buy nuclear and missile technology outside of JCPOA-approved channels. Iran has refused to grant international inspections of nuclear research and military facilities. The International Atomic Energy Agency, in its most recent report on Iran and the nuclear deal said Tehran continued to inform the agency about its heavy water produced at the Heavy Water Production Plant 11. As of February, the plant was continuing to operate and the stockpile was 117.9 tons, below the 130 tons limit. The IAEA made no mention of Iran's sales of heavy water. Secretary of State Mike Pompeo, until recently the CIA director, said April 12 of Teheran's compliance with the nuclear accord that "I've seen no evidence that they're not in compliance today." The judgment reflects what some intelligence critics have said is a widespread bias within the U.S. intelligence community in favor of keeping the Iran nuclear deal. A spokesman for the office of the director of national intelligence declined to comment when asked if Iran was violating the JCPOA. DNI Dan Coats told a Senate committee in March that Iran was in compliance with the JCPOA and that "the judgment [of the intelligence community] is there has been no material breach of the agreement." Since heavy water production was restarted in Iran beginning in June 2017, Iran has maintained a stockpile of more than 100 tons of heavy water. Bolton told reporters Tuesday that the Iran deal was defective and that the administration would be seeking to reach a more comprehensive international agreement that addressed the totality of Iran's nefarious activities, including missile defense and support for terrorism. "Look, this deal was fundamentally flawed, as the president said," Bolton said. "It does not do what it purports to do. It does not prevent Iran from developing deliverable nuclear weapons. It allows Iran to continue technologies like uranium enrichment, reprocessing of plutonium. It allows them—even if they're in compliance with the deal—to increase their research and development on the sophistication of their nuclear capabilities. And it simply has an utterly inadequate treatment of the military dimension of Iran's aspirations." A key factor in Trump's decision to withdraw from the JCPOA was the disclosure by Israel that Iran was secretly maintaining an archive of all its nuclear weapons research at the same time it is continuing to build long-range missiles capable of delivering a nuclear warhead. "Contrary to basic arms control agreement practice, there was never a baseline declaration," Bolton said. "In fact, Iran has consistently denied it ever had a military program. That's enshrined in Security Council Resolution 2231. And as we've seen from the data that we've collected before, that Israel discussed last week, this is a flat lie." Israeli intelligence stole documents revealing the full dimensions of Iran's nuclear weapons activities, including design for missile warheads and underground nuclear weapons testing. The documents contradicted Iranian government claims that there was never a nuclear weapons program. 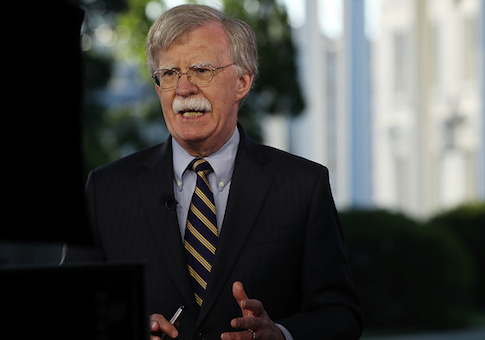 Bolton also said the Iran agreement lacked adequate inspection provisions and as a result was preventing the United States from having confidence that all nuclear activities could be detected. Another fundamental flaw of the Iran deal was that it would lead to a moderation of Iranian government behavior, such as an end to support for terrorism and subversion in the Middle East and elsewhere. Bolton said that assumption "has also proven completely false." "So recognizing that Iran has used the course of the negotiations, the lengthy period leading up to the deal to increase the capability and sophistication both of its nuclear weapons program and its ballistic missile program, and has continued to do so since the deal in 2015, the only sure way to get on the path of stopping Iran from developing nuclear weapons and delivery capabilities is to get out of the deal," he said. "And that's what the president has done." The rejection of the nuclear deal by the United States triggered opposition from supporters, including former President Barack Obama who called the abandoning of what many regard as his most significant foreign policy achievement a serous error. Obama adviser Ben Rhodes said the pullout "just made the world a more dangerous place in ways that begin with Iran's nuclear program but go far beyond it." Former Secretary of State John Kerry, who secretly colluded with Iranian officials in a bid to prevent the United States from withdrawing from the accord, said Trump's action weakened U.S. security. "We should all hope the world can preserve the nuclear agreement," Kerry said. Under the terms of the nuclear agreement, Iran promised not to build nuclear weapons but is permitted to do so in seven to 10 years, when constraints on its activities are lifted. Cotton praised the president's action. "The Iran nuclear deal, terribly flawed from the beginning, at best only delayed Iran from getting the bomb while handing over hundreds of billions in sanctions relief, money that Iran uses to support terrorism and build long-range missiles," Cotton said. "Tough sanctions are a first step toward rolling back Iran's campaign of terror, but it won't be the last. If the ayatollahs rush toward the bomb, the United States must end the program once and for all." This entry was posted in National Security and tagged Iran, Iran Nuclear Deal, John Bolton. Bookmark the permalink.